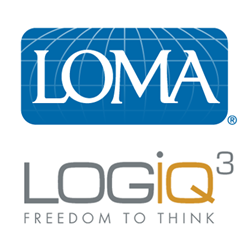 LOMA, an education trade association for the financial services industry, today announced its partnership with LOGiQ³, a life insurance and reinsurance services provider, to deliver selected LOGiQ³ underwriting courses. Through the partnership, LOGiQ³’s video-based underwriting training courses, suitable for all levels of underwriting, will be available to LOMA members through LOMA’s learning website. These underwriting courses cover a variety of medical and non-medical topics and consider all facets of mortality risk selection. “In today’s highly competitive market, offering comprehensive training and development opportunities can help insurers attract and retain the best underwriting professionals. LOGiQ³’s courses complement LOMA’s existing catalog of underwriting education courses, and we believe they will assist our members as they seek out quality training and development opportunities for their underwriting staff,“ said Katherine C. Milligan, FLMI, ACS, senior vice president LOMA’s Education & Training Division. Visit http://www.loma.org/ProfDev/Courses/SOC.aspx to see a complete listing of LOMA’s Short Online Courses. Established in 1924, with nearly 1,200 member companies in over 80 countries, LOMA is committed to a business partnership with its world-wide members in the insurance and financial services industry to improve their management and operations through quality employee development, research, information sharing and related products and services. To find out more about LOMA and the learning opportunities it offers, visit http://www.loma.org. LOGiQ³ is the expert provider of life insurance and reinsurance consulting and outsourced services. LOGiQ³ delivers long-term strategic solutions and short-term tactical support across Underwriting, Reinsurance Administration, Claims and Audit. LOGiQ³ supports clients across the life insurance service chain from agent to retrocessionaire from its offices in Toronto, Canada, and Cardiff, UK. To learn more about LOGiQ³, visit http://www.logiq3.com.